The agency announced Monday the NanoSail-D ejected from the its mothership, the Fast, Affordable, Science and Technology Satellite, or FASTSAT. The deployment was supposed to trigger a three-day timer before issuing an automatic command to unfurl a 100 square foot ultra-thin polymer sail from NanoSail-D, which is about the size of a loaf of bread. NanoSail-D's spring-ejection was indicated at 1:31 a.m. EST Monday, leading to a predicted release of the spacecraft's sail membrane around 1:30 a.m. EST Thursday. But officials fear something went wrong with NanoSail-D. Engineers have been unable to contact the spacecraft since its suspected release early Monday, according to Kim Newton, a spokesperson at NASA's Marshall Space Flight Center in Huntsville, Ala.
NASA posted an update on the mission website late Friday saying "it is not clear" that the small spacecraft was deployed from FASTSAT. "At the time of ejection, spacecraft telemetry data showed a positive ejection as reflected by confirmation of several of the planned on orbit ejection sequence events," the statement said. "The FASTSAT spacecraft ejection system data was also indicative of an ejection event." NanoSail-D was mounted in a P-POD ejection apparatus inside FASTSAT. 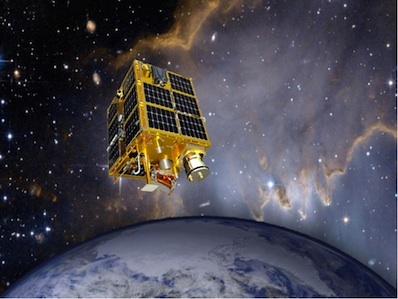 P-PODs are typically positioned to release CubeSat spacecraft from launch vehicles, but NanoSail-D was expected to become the first CubeSat to separate from a microsatellite. Containing the small solar sail experiment and five other technology investigations, the 300-pound FASTSAT spacecraft launched Nov. 19 on a Minotaur 4 rocket from the Kodiak Launch Complex in Alaska. NASA still has not confirmed the sail deployment event, which was programmed to occur this week. Four spring-loaded guide booms were expected to pop out of the compact spacecraft, then the polymer membrane was designed to stretch tight in a diamond shape within about five seconds. "The FASTSAT team is continuing to troubleshoot the inability to make contact with NanoSail-D," NASA's statement said. "The FASTSAT microsatellite and all remaining five onboard experiments continue to operate as planned." NanoSail-D's primary objectives were to eject the 8.5-pound satellite from FASTSAT and deploy the solar sail. NASA launched an identical NanoSail-D spacecraft in 2008, but the satellite was destroyed in a rocket mishap. Engineers spent the last two years preparing a backup spacecraft for blastoff. Both NanoSail-D vehicles were assembled on a budget of $500,000, according to Dean Alhorn, the NanoSail-D project manager at Marshall. 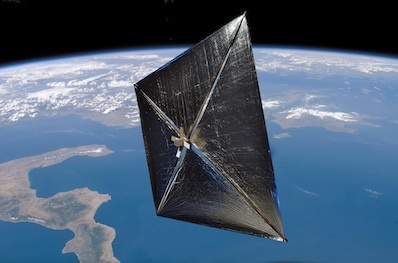 The craft's solar sail is designed to harness light pressure from the sun to change its orbit, eventually slowing the craft's speed enough to drop from orbit and burn up in Earth's atmosphere. NanoSail-D was designed to stay in orbit between 70 and 120 days, depending on atmospheric conditions.